The laws of thermodynamics state categorically, evolution did not contemplate democracy, and despite our infatuation with its promise, it is one of the least effective and most wasteful deployments of our clearly finite and put upon planetary resource. ‘Till Debt Do Us Part’,(T-Rex & Homo Sapiens, Darwin & Thermodynamics, The Psychoanalytics of Failure & an Rx for Repair) contemplates a resolution of the fundamental conflict Capitalism has fostered and articulates a reasonably sensible and historically effective mechanism to allow a sustainable model for repair which will work in 21st Century America and be acceptable to both left and right, Republican and Democrat alike. ‘Till Debt Do Us Part’ explores the psychological and societal origins of Capitalism tracing its passage from an Agrarian society with a patriarchal structure caring for extended family from which arose the ‘rule of law’ through the replacement of Commonwealth by Corporate Wealth and the decline of family structure. Without the moral structure arising from of a direct relationship to a core family enterprise, Capitalism has not only taken root, the ‘Rule of Law’ has come to serve those in power and wealth, the Corporate Oligarchy, leaving an enormous and nearly irreconcilable divide. Close to collapse, social systems failing, whole populations falling off the edge, lacking health care, education and the provision of tools to compete in a flat, global world without sufficient safety nets, we, like the T-Rex are steps away from extinction. 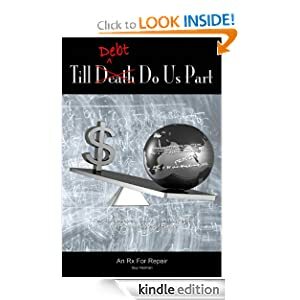 ‘Till Debt Do Us Part offers an elegantly simple, sustainable and universally acceptable solution to the gridlock and imminent collapse our culture faces, which is acceptable to both rich and poor, democrat and republican alike.